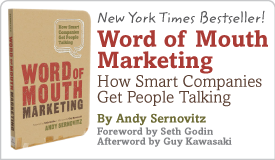 The fundamentals of being buzzworthy | Andy Sernovitz | Damn, I Wish I'd Thought of That! Word of mouth only works for great products, made by great companies, backed by real support. If you don’t make a product worth talking about, no amount of stunts, gimmicks, or tactics will overcome this. This is what makes word of mouth so amazing: The good guys win, the bad guys don’t. One smart, hard-working person can do wonders for a company’s word of mouth. But legendary word of mouth brands are built when everyone is earning the respect and recommendation of customers. This takes more than a dedicated person; it requires committing to a fundamental philosophy in how a company should operate. You’re officially a buzzworthy company when you’re leading a movement and not just cranking out widgets and service offerings. It comes from standing for something and developing a community of evangelists who want to see you succeed. What are you out to fix? What are you going to change? Why should we follow you? Why should we bring our friends?